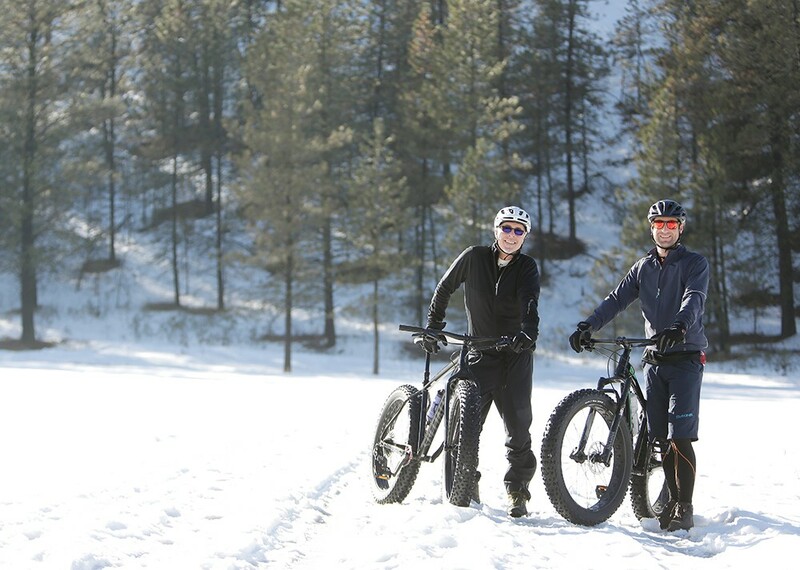 Greg Britton (left) with a Specialized Fatboy and Trent Armstrong with a Salsa Mukluk at the 7 Mile area of Riverside State Park. The Columbia Plateau route runs 150 miles from Pasco all the way up to the Fish Lake trail in Spokane. It's relatively flat and free of car traffic, as it runs on an old abandoned railroad track. But wooden railroad ties and the rocks packed between the rails would seem to make riding a bike on the route impossible. Bike tires would just spin or sink between the rocks. At least, they would on a normal bike. But Ryan Griffith, teen/outdoor recreation program supervisor for Spokane's Parks and Recreation department, isn't riding a normal bike. He's on a Specialized Fatboy bike with massive 4.6 inch-wide tires, big enough to climb over obstacles and wide enough to not sink into the ballast. "It's almost like a snowshoe for your bike," says Griffith. He and two of his friends recently packed their gear on three fat-tire bikes and set off across the tracks on a two-and-half day backpacking journey. The rise of fat-tire biking has opened up entirely new landscapes — like gravel, sand and snow — to cycling fanatics. Even for longtime cyclists, fat-tire biking presents a new sort of thrill, a new kind of adventure. "It's like when you're a kid — you've got a big wheel when you're starting, and now you're riding your bike," Griffith says. "Once you do it, you're hooked." "We couldn't get anything," says the Bike Hub's John Abernathy. "We had a huge demand, and all the people who were making fat bikes were sold out." Even he couldn't get a bike back then. "It was such a radically new thing that nobody was used to," Bike Hub manager Mic Woodruff says. "A couple of years ago at the Interbike convention, it seemed like every booth had something to do with fat bikes." Riding one, he says, feels like riding a "monster truck." He recalls riding on a street, coming up to pedestrians who were walking on the sidewalk. "I scared the crap out of them, more than a few people," Woodruff says. "Because the noise that these things make — aaaar-raaar — kinda sounds like a monster's comin' at ya." 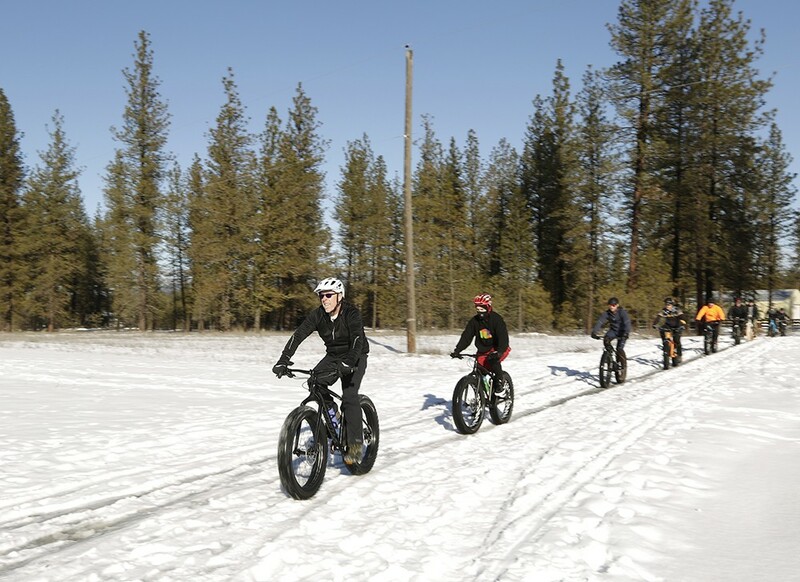 In particular, fat bikes have gained the reputation of being able to be used in snowy terrain. Ruts in the snow have a way of jerking a bike widely in the wrong direction, sending you tumbling to the ground. But with fat tires, says Greg Britton, general manager for Wheel Sport, you can run the air pressure a lot lower. That not only smooths out the bumps in the terrain — eliminating the need for fancy suspension — by putting more of the surface area on the snow, but it can also give you more traction. You've got more control, he says, and stability. You can ride on uneven terrain. 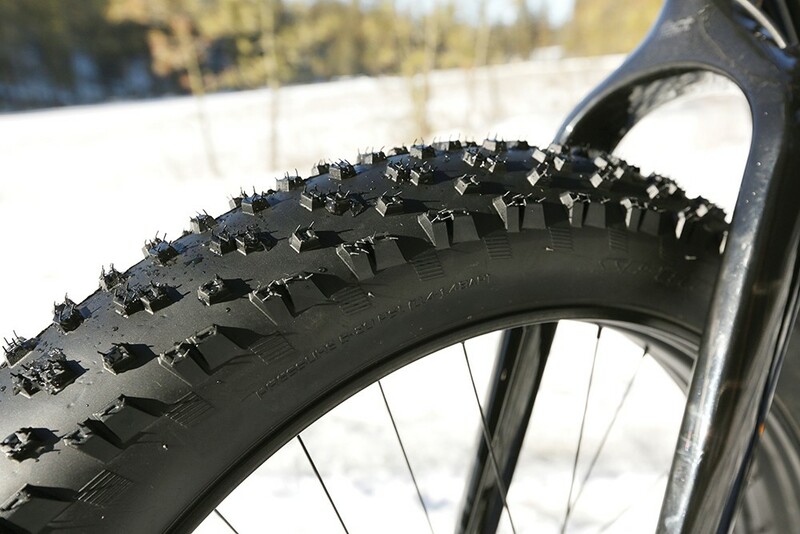 Install fat bike studded tires — pricey though they are — and you have yourself the ultimate winter cycling hack, able to climb over both uneven packed snow and manage decently on ice. Still, the term "snow bike" will make a lot of fat-tire bikers cringe. Aficionados know that they can perform just as effectively in sand or off-road conditions. "I would consistently see 10 to 20 percent of people on fat bikes in summer weather," Britton says. "It's a Swiss Army knife. It can do everything." That's one secret to fat bikes' popularity. 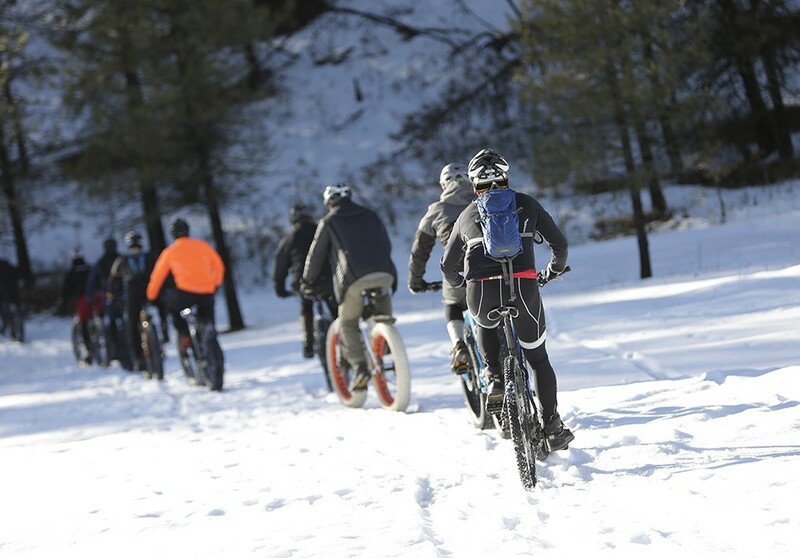 Fat tires can be nearly five inches wide, allowing riders to cross soft or rugged terrain. Maddie Speare, a 15-year-old mountain bike and cyclocross racer, says she first rode a fat-tire bike back in seventh grade. She loved it. The big wheels made her feel taller. She found she could pull off controlled drifts in the snow. She glided over big bumps that once made for uncomfortable jolts. "It was crazy. It's so bouncy — you go over everything," Speare says. "You go over a log and just jump up on it." Her dad got her a Surly Pugsley fat-tire bike, she says, and it made the rest of her mountain biking team jealous. "They're all bike nerds," Speare says. "They're all, 'Oh my god, I want one, can I try it?'" For all the thrill of the fat-tire bike, riding one is not necessarily easy. Big tires aren't quite as nimble as skinny ones. Fat bikes, by their very nature, are heavy. Trying to pedal a bike like that up a steep hill is exhausting — especially if you're trying to pedal through snow. "People find out how damn hard they are to ride in the snow," Woodruff says, "no matter what size your tires are." The snowshoeing metaphor, after all, works both ways. "Snowshoeing is really hard work. It's harder than walking," Abernathy says. "You're going to get there. You're not going to get there fast. But you can get anywhere you want." Though the national demand for fat-tire bikes has lessened, for some in Spokane, enthusiasm hasn't dimmed. Quite the opposite. "Right, now we're in the infancy of it," Britton predicts. In particular, he sees the trend of "bikepacking" taking off. The wider tires not only let you climb over bumpier terrain, the stable base lets you pile on heavy gear without destabilizing your bike. A fat-tire bike lets you go farther on a backpacking trip and carry more. Off on a winter's ride in the hills around Riverside State Park. In January, Wheel Sport and Bike Hub held a Winter Bike Showcase at the Iron Goat brewery. "We're trying to get more people to think about riding in the winter," Britton says. One way local enthusiasts are trying to do that? Grooming. Just as with cross-country skiing, some types of snow are horrible for any type of bike. The widest bike tires in the world can't handle particularly deep powder. Wheel Sport, the Evergreen Mountain Bike Alliance and the Spokane Parks and Recreation department have plans to groom certain areas like Antoine Peak, Riverside State Park and Palisades Park. This season, Spokane Parks and Rec has groomed trails at the Dwight Merkel Sports Complex and at Indian Canyon Golf Course; both require that you ride only on marked trails. "We bought a groomer that puts a 24-inch-wide track down," Britton says. "It's called the Trail Tamer." Groomed snow is firmer and smoother allowing fat tires to glide by without any problem. For some cyclists, however, conditions are never a reason to not bike.Four-and-a-half years ago, Angela Trobaugh-Lotrario, a pediatric oncologist at Sacred Heart Medical Center, started biking to work. Most of the year, she'll ride her regular bike. "When there's ice, I change over to the mountain bike," Trobaugh-Lotrario says. "When there's more than inch of snow, I ride my fat bike." During the really snowy days, she says, her rides to work take on an a meditative quality. "It's really quiet and peaceful," Trobaugh-Lotrario says, "It's almost like you can hear the snow falling." On one snowy commute, she remembers pausing while climbing up a steep hill, and spotting a a beautiful northern flicker perched on a nearby pole. If she had been stuck in her car, like during previous winters, she thought to herself, she never would have seen that. COLUMBIA PLATEAU TRAIL Ride along railroad tracks 150 miles from the Fish Lake Trail near Spokane; runs all the way to Pasco. CAMP SEKANI Prime location off of Upriver Drive, next to the Spokane River, offers miles of mountain bike trails and a large bike skills park. DWIGHT MERKEL COMPLEX As part of a Spokane Parks pilot program, Dwight Merkel offers a groomed fat-tire bike track. Find the trailhead at 5701 N. Assembly in Spokane. RIVERSIDE STATE PARK With more than 70 miles of trails open to mountain bikers, there are multiple entrance points to this 14,000 acre gem — the largest state park in Washington. Remember to get a Discover Pass for parking. The original print version of this article was headlined "Big Wheels"